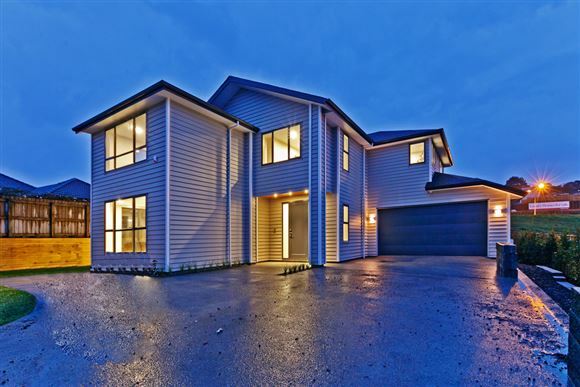 This brand new weatherboard home in a developing sought after area of Greenhithe has been well designed to offer bright and very spacious living throughout. Excellent open plan kitchen/dining with seamless outdoor flow to deck, plus a separate formal living room. Downstairs provides the perfect granny potential with 2 bdrms, living space and shower. Beyond the additional living space upstairs, there's a bedroom to suit everyone. There's the master bed with double vanity ensuite and corner spa bath, and walk in robe, and a further 3 bedrooms (one with ensuite). Beautifully finished bathrooms throughout, easy care grounds, double garage, additional off street parking, and minutes to motorway access. This is the perfect lock and leave family home, but you wont leave disappointed!